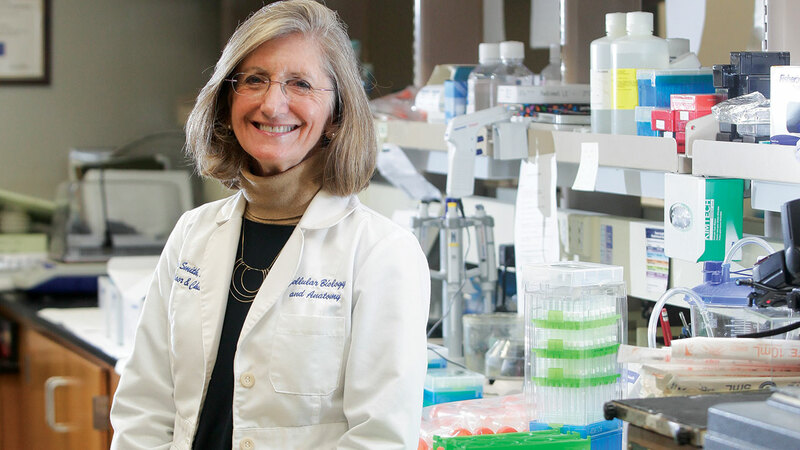 Dr. Sylvia Smith, Regents’ Professor and chair of the Department of Cellular Biology and Anatomy, has spent more than three decades examining the retina, with the goal of treating and preventing retinal diseases. Under the microscope, the retina is a thing of beauty. The multiple layers display a perfect order and symmetry. There’s an intricate organization and stratification, and function follows that flawless design. That is, until blinding diseases like retinitis pigmentosa and macular degeneration mar the perfection. Inside her lab at the Carl T. Sanders Research and Education Building, Dr. Sylvia Smith — Regents’ Professor and chair of the Department of Cellular Biology and Anatomy at the Medical College of Georgia and co-director of Augusta University’s James and Jean Culver Vision Discovery Institute — has been working for more than 30 years to restore order to retinas damaged by disease. In 2008 and then again 2016, the world took notice when Smith published findings confirming that a drug commonly used as a painkiller was found to bring about a striking preservation of retinal cells, first in a model of diabetic retinopathy and later in a model of severe inherited retinal degeneration. During the early days of the work, Smith admitted, “It may be a little ambitious,” referring to the hypothesis that these types of compounds could prevent retinal cells from dying. But ambition has its place. Today, Smith is widely recognized as one of the world’s experts on retinal cell biology. The same year she published her last major finding in the Proceedings of the National Academy of Sciences, she was appointed to the National Advisory Eye Council, where she will serve until 2020. Along with some of the greatest minds in eye research, she is one of 12 voting council members to advise the secretary of the U.S. Department of Health and Human Services Sylvia M. Burwell and National Eye Institute Director Dr. Paul. A. Sieving. It is an awesome responsibility. Together with the other members, Smith not only reviews and makes recommendations on grant applications for biomedical research or research training programs made to the NEI, but also assesses vision research efforts across the nation and makes recommendations for how to stimulate research in needed areas. Those research priorities include a wide spectrum of diseases and disorders that remain the leading causes of blindness and impaired vision in the United States, conditions like glaucoma, corneal diseases, cataract, and of course, retinal diseases. 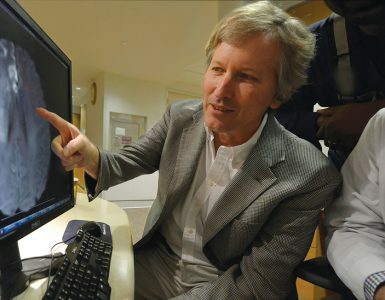 Smith’s own work in the retina has been continuously funded by the National Institutes of Health since 1992. Although she began her career as a speech-language pathologist — inspired by a childhood interest in Helen Keller — it’s fortunate for the field of retinal study that Smith learned early on that it wasn’t the path for her. But then she called the anatomy department at the university and was able to speak directly with Dr. K. Lemone Yielding, the department chair. “I’d like to talk to you about working in your lab if you let me,” she said boldly. Smith worked with Yielding on a colon cancer project and during her time on staff was also accepted into the PhD program in anatomy. The retina came into play soon after, when she started studying a DNA alkylating agent that was a mutagen, carcinogen and a teratogen, and measured its effect on the retina and cerebellum of the offspring of the pregnant mice it was administered to. It was a productive time. Smith was taking a systematic approach to the histology of the retina — and interrogation of function — at a time when branches of study like molecular biology were not available. She soon grew to know and appreciate the function of the many cells in the retinal layers – both the wildtype and those with mutations — so much so that she admits she used to carry a photo of a retina in her wallet. Her work on the pregnant mice also proved fruitful. She confirmed that late-onset retinopathy was the result of a “single insult on a day in gestation when photoreceptor cells are being born.” It would form some of the basis of her work further down the line. Following her time in Mobile, Smith landed a postdoctoral position in Bethesda, Maryland at the National Institutes of Health, specifically the National Eye Institute’s Laboratory of Retinal Cell and Molecular Biology. Smith worked for four years in LRCMB alongside scientists such as Dr. Paul O’Brien, a leader in the field of rhodopsin biochemistry, honing her skills in biochemical studies of the retina. Biochemistry was starting to come into its own then, providing valuable tools to pursue molecular information about the eye. Then a breakthrough: The disease retinitis pigmentosa was found to be due to a genetic defect in the protein rhodopsin, found in the rods of the retina. Smith moved on to studying post-translational modifications of rhodopsin. It was more knowledge that Smith would build on in her later work. Smith joined MCG on July 1, 1991, and continued her work in analyzing retinal function and in better understanding retinal diseases. She was fortunate to receive her first NIH grant on her first submission, and the project continued for a number of years. But while the studies of a mutation that led to photoreceptor cell degeneration were fascinating, “I realized I needed to hone my skills in molecular biology to move the work forward,” she said. So when transporter biologist and Regents’ Professor of Biochemistry and Molecular Biology (and later chair) Dr. Vadivel Ganapathy invited Smith to join him on a project examining how transporter proteins work in the retina, offering a new way to study function at the cellular and molecular level, she jumped at the opportunity. Ganapathy had already been studying transporter proteins in the gut, kidney and placenta so studies of transporters in the retina would be a good blend of two independent research areas. The first transporter they studied was for folate, a vitamin that’s necessary for neural tube formation during pregnancy. They were subsequently funded by NEI to study folate in the retina. Smith and Ganapathy also found that folate has a vital role in warding off retinal damage by reducing levels of the amino acid homocysteine. Without folate, homocysteine causes tiny clots that damage the retina’s rich array of blood vessels and its neuronal network. They soon found that sigma receptor did indeed not only have a presence in the retina but an essential one. Without it, Müller cells in the retina, which are responsible for supporting the millions of specialized neurons that enable us to transform light into images, can’t rein in destructive oxidative stress. Likewise, ganglion cells, those nerve cells lining the back of the retina, die in the presence of high glucose levels. And in eyes containing a genetic mutation in rhodopsin, without sigma receptor, first rods then cone cells break down, leading to loss of night vision and later blindness. Smith and her colleagues posited that activating sigma receptor with a compound that could bind to it (termed a “ligand”) could help stop or at least slow down these processes. It was the next logical step. While these compounds aren’t normally found in the body, they are known for their ability to protect cells and were just beginning to be studied for their potential in memory disorders and other diseases. One of the most potent ligands for sigma receptor is pentazocine, so that became the compound they would test first and later explore extensively. Pentazocine might not have seemed the most obvious choice. It’s an opioid used to treat moderate to severe pain and can also be used as part of anesthesia during surgery. Initially — “We thought the experiment would fail, that we would see nothing,” said Smith. But the surprising early results, which have been repeated again and again, are that the ligand has huge promise in restoring the natural order of the multilayered retina. Smith is now turning her attention to what exactly is the effect of the ligand on sigma receptor. She thinks that activating sigma receptor with the drug may increase the activity of the natural antioxidant protein NRF2, and potentially other mechanisms to better protect cells. In models of advanced retinitis pigmentosa, in the absence of NRF2, the disease runs unchecked, even with the application of the ligand. “Our preliminary data, presented at the 2018 International Symposium on Retinal Degeneration, suggest that if you don’t have NRF2, you won’t have protection,” said Smith. The only caveat of the treatment? Pentazocine, like many other painkillers, also offers the unwanted side effect of respiratory depression if used in excess — a challenge when it comes to the idea of proposing it in clinical studies. That new compound, Smith hopes, will provide pentazocine’s benefits without its side effects. It — along with continued study of the role of NRF2 and homocysteine — is the next turn in the road for Smith. There are still so many questions: How long with the protective benefits of compounds like pentazocine last? 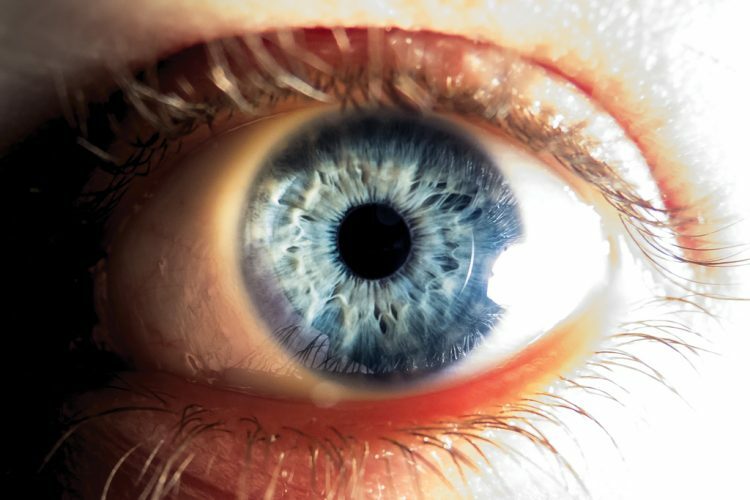 What will the benefits be in animal studies and P23H mice, which have rhodopsin mutations more similar to the most common form of retinitis pigmentosa in humans? How exactly does that interaction with the protein NRF2 work, and what happens in the absence of that protein? Finally, back to that original homocysteine work: At what level does the amino acid add to retinal disease? For many patients, the ultimate question of course is whether, one day, gene therapy to prevent these blinding diseases could be possible. After being a faculty member in the Department of Cellular Biology and Anatomy for more than two decades, Smith put her name forward as chair in 2012 when the role came open. From a list of 10 candidates — the other nine culled from a national search — Smith was named chair in 2013. Today, the Department of Cellular Biology and Anatomy is unique in the extensiveness of its education mission in addition to its research mission. “We have to balance both and have extraordinary faculty who are up to the task,” said Smith. Through the efforts of outstanding educators, including Drs. Carol Nichols, Bill Pearson, Anna Edmondson and Alexa Hryniuk — who are leaders in innovative approaches to medical education, sharing their expertise with educators nationally and internationally — the department provides about 60 to 70 percent of the curriculum for first-year medical students in Augusta. 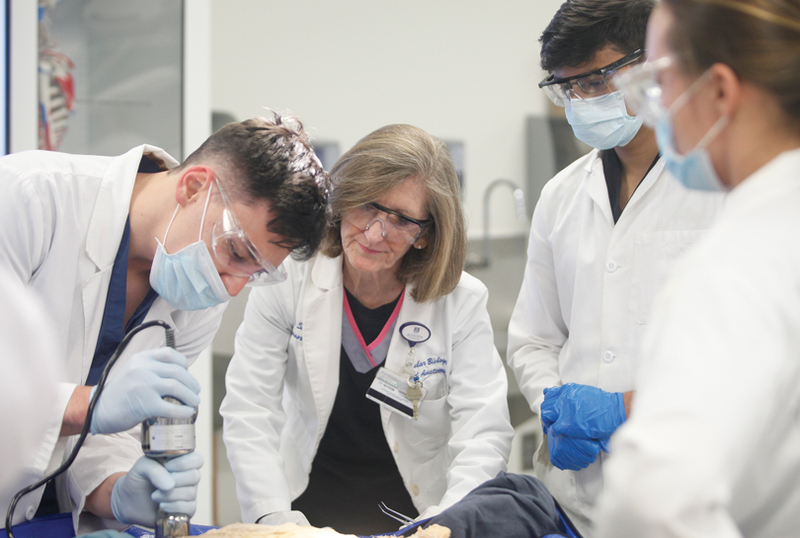 “The impact is significant,” said Smith, particularly combined with the curriculum offered at MCG’s Athens campus in partnership with the University of Georgia, executed by Drs. Thom Gaddy, Eve Gallman and Brett Szymik. The department also oversees a robust PhD program for graduate students interested in a career in cell biology and anatomy. Under Smith’s leadership and the efforts of many research mentors and course directors, such as Dr. Patricia Schoenlein, who oversees the molecular biology core graduate course, the program has grown 50 percent over the past five years with more than a dozen graduate students now in the department. Her leadership style can’t be summed up in one word, but if it could, it would be: voice. In fact, while she is loathe to take credit (her words), under Smith’s leadership, the department has achieved a significant research goal: As of September 2018, every faculty member, whose primary academic duty is basic science research, has extramural funding for the first time in at least the past 20 years. 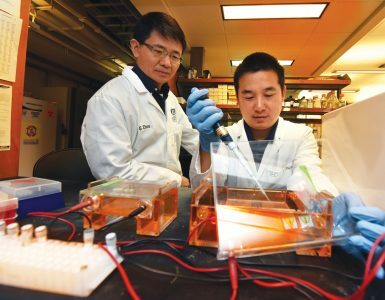 Over those years, the department’s research portfolio has spanned a broad range of interests, but in the past decade has honed in on three major focus groups: bone and muscle aging, kidney injury and vision loss. During her time as chair, Smith has recruited four new researchers, including Dr. Meghan McGee-Lawrence, a bone/mineral biologist and biomedical engineer; Dr. Yutao Liu, a geneticist studying the comparatively rare and harder-to-treat exfoliation glaucoma and the cornea-shape changing condition keratoconus; Dr. Sang-Ho Kwon, who studies exosomes — cellular components that play a part in cell to cell communication and disease transmission — and their role in kidney dysfunction; and Dr. Xingjun Fan, who studies reactive oxygen species in aging and age-related diseases, especially cataracts. They join Dr. Mitch Watsky, a corneal researcher and dean of The Graduate School at AU; Dr. Ming Zhang, who studies cytomegaloviral infections of the retina; Dr. Ruth Caldwell, who examines the role of the enzyme arginase in the retina; Dr. Zheng Dong, Charbonnier Professor and cellular biologist whose research seeks to delineate the molecular mechanisms of cell injury and death, especially in kidney; Dr. Jian-Kang Chen, an expert in acute kidney injury; Dr. Mark Hamrick, Weiss Professor, director of the CBA graduate program and a key investigator for an NIH Program Project grant that investigates bone formation and aging-related loss; Dr. Graydon Gonsalvez, who studies cell polarity; and Dr. Ellen LeMosy, who examines craniofacial and nervous system development. 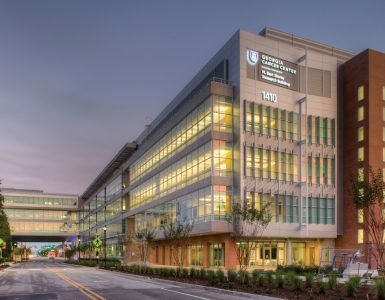 With extensive extramural support from the NIH, the department’s research strives to become increasingly translational and clinically relevant.